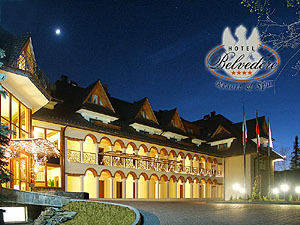 Crocus Business Hotel **** in Zakopane is a modern luxury hotel. Located in the center of Zakopane, and yet in the immediate vicinity of the Tatra National Park, Great Krokiew, Nosal ski complex and the cable car to Giewont. It's an option for those who are looking for a place of high standard and an unforgettable atmosphere. Conference and Recreation Centre "Hyrny" is located on a quiet street running from Krupowki the ski jumps.Guests will be able to enjoy the beautiful view of theÂ Tatra Mountains. The three-star Hotel Liptakowka is the latest generation of property located in the heart of Bialka Tatrzanska, near the ski slopes of Kotelnica Bialczanska and Bania Thermal Pools. Located close to the center of Zakopane, the Fian hotel offers guests stay in a modern, comfortable facility located in a charming corner of the city, near the mountain resort's main attractions. Zakopane is a picturesque town situated at the foot of the Tatra Mountains. It is a famous Polish winter sports center and the most popular resort. Tourists will find a huge number of ski slopes. Even the most demanding skiers will find excellent conditions for sport. Around Zakopane mountain views, great delight, deep valleys, steep mountains covered with snow. No main street of Zakopane - KrupĂłwki is the main pedestrian walking where we find examples of folklore and rich highland culture.